The plastic card is a product increasingly popular. It is robust, has a prestigious appearance and its durability makes it a very advantageous choice in the long-term. The many characteristics it can include make it an extremely multipurpose product. and options are not possible. We offer more than just card manufacturing to our clients. We can assist you in the design of the card to its mailing. We can you assist in the design of your cards within your corporate image. Our knowledge of the individual product specifications and the requested features will be greatly beneficial. We offer a turnkey printing service of plastic cards. The information on them can be overprinted in black on preprinted cards. Personalized cards can also be printed entirely on request. The card can be placed on a support, such as a letter. We have developed over the years a very good business relationships with several workshops mail processing. We will coordinate with them addressing and mailing your cards. We offer a full range of printed products that will meet all your needs. Some stores and credit providers issue customer cards or gift cards (cards with a predefined monetary value and, in some cases, can be recharged), with a magnetic stripe or a bar code using means of accessing mainframe in sales transactions. Customer card can also be used for a service subscribers, such as libraries. They issue cards with bar codes to identify their customers and to access their electronic database. 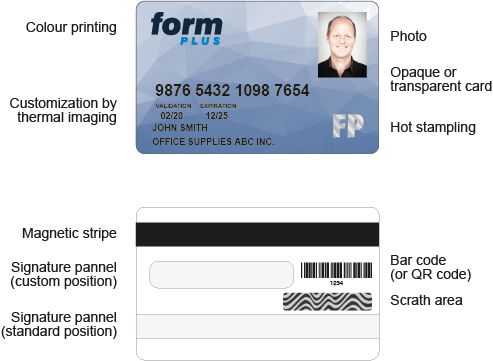 The card can record outputs and library material returns and also add money there to use photocopiers or the Internet through a magnetic strip or chip. The card can be the same size as a standard credit card or it can be a smaller card that can be placed on a key chain. 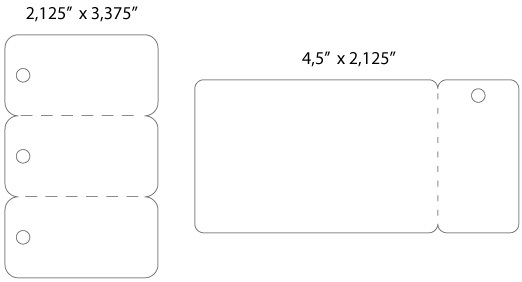 There also exists combinations of both sizes. Loyalty cards are often issued by a group of merchants for the common benefit of all participants. These cards have a magnetic stripe and bar code using the information of the cardholder to give him rewards points. Once accumulated, these points can be redeemed by the customer. A loyalty card could also have an area with boxes to scratch when a privilege is used. An access card, or hospitality cars, is mainly a key. Hotel use them as a security measure and to give access to their accommodations. They may be used the same way by office buildings. Many service providers or employer issue identity cards to their customers or employees. Their main characteristics is that they include a photo of the cardholder. They can also give access to the issuer’s installations. A majority of professional orders and associations issue card to their members so as to prove their affiliation and the payment of the annual membership fees. Also, a private medical clinic could issue card to their paying members. A plastic card can be used in place of an ordinary cardboard business card. It offers prestige that will make a marked impression! Long-term sales promotions are also suitable to the use of plastic card, given its sustainability. A privileged customer could, for example, enjoy an exclusive discount for a year on presentation of their card. The card could also be sold by a charitable organization and include discounts and promotions applied to sponsors. It can be very convenient to provide a key tag card, alone or combined with a regular sized card. If the card is used frequently, as card access to a fitness center or as a loyalty card for a coffee shop for example, it is more easily accessible if it is on the key chain of the holder. Many combinaisons of regular and key tags are available. To see all possible combinations, refer to the PDF below. We also offer card holders that can be customized to match the design of your cards. Several sizes and styles are available. We can provide you with badge holders and lanyards to make your cards visible and easily accessible. We can offer card printing service as proof of certification, skill or training. Cards may include the photo of the person holding the card.